My friends visited my place for the long weekend. I got two packets of bread which I did not use. I did not want to waste them. One of my friends make bread rolls often. So I tried these bread rolls and they are as tasty as cutlets. They are really a wonderful snack with tea :). Heat oil in a pan and add the green chillies followed by ginger, garlic and chopped onions. Fry till they become translucent and add turmeric powder, sambar powder, red chilli powder, coriander powder and pepper powder. Fry for 2 minutes and then add the mashed potatoes, garam masala powder and salt. Mix well and add the boiled peas. Then add the chopped coriander leaves. Let it cool and in the meantime, take the bread slices and cut the edges as shown in the pic. Take a bread slice in the hand sprinkle some water on both the sides and press them in the palm so that the extra water is removed. Take 2 tsp of the stuffing and keep it in the middle of the bread. Roll the bread and seal it at the ends. Dip the rolls in bread crumbs and deep fry them till golden brown. We can deep fry directly without dipping in the bread crumbs. I have tried both (see the second pic). But the bread crumbs make the rolls more crispy. We can use any vegetables or even paneer and change the stuffing according to our own taste. 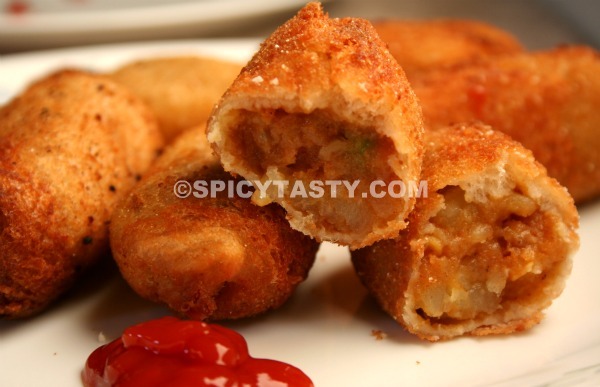 To avoid deep frying we can put it in a pan as we do for Aloo tikki or we can keep it in oven at 350F for 40 minutes. 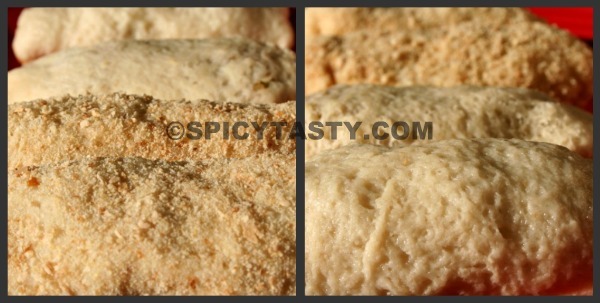 Simply mouthwatering and marvelous bread roll. Awesome preparation. I love them they look morishly delicious. Delicious , love this spicy tea time snack. Yummy and perfect looking bread rolls. Hey Arthi, bread rolls look so delicious..btw, how are u doing? been ages heard from u.. This is such an interesting recipe – so you roll the stuffed and softened bread slice in bread crumbs – Love it and bookmarking to try! thanks for sharing! Simply mouthwatering and lovely golden color! a plate of these crunchy beauties with some tea- yummmmmmmmm ! They look so so perfect! Loved the recipe! Awesome snack for my girls gettogether this weekend. Nice dish arthi and a nice way to use leftover bread. 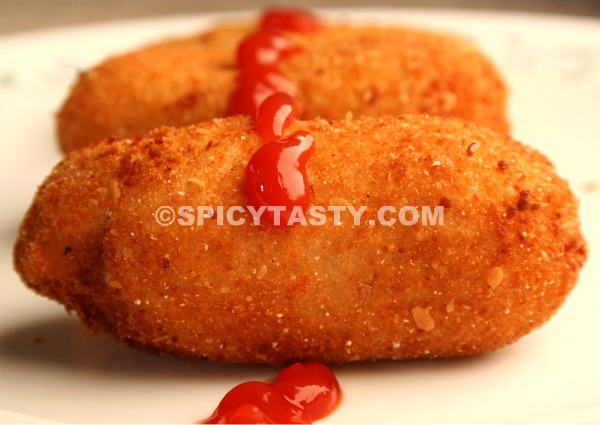 I have a version where I roll them up, refrigerate them and cut them in to rolls and shallow fry them on a tava…Of course there is always the fun of having fried food with ketchup or sweet chutney! Thank you all for your valuable comments..